Teaching the next generation of children is never easy, the free Day Care Center Yearly Expense Calculator can help you see how much it would cost to run your own day care center. There are bound to be many unforeseen expenses but this template helps you gain a rough idea of what it will cost. You’ll receive plenty of examples to set you on the right path. This template also calculates totals automatically for your convenience. Using this free tool, you can find ways to afford the items you need to run a day care in a way that’s successful for both you and your children. All you need to do to get started is follow the set list of instructions displayed below. To download the free template document, you can follow the link at the bottom of this page that we have provided for you. You will notice that the entire template is has a different tab for each month of the year and a page that keeps track of the totals. First, find the current month and click on the appropriate tab below. Now, each tab has different categories in the first column, you can easily change these to items that fit your need by clicking the cell and writing something new. When you start each day, list the amount of money each expense cost you in the corresponding cell below. You will continue for every day and every month listing these items. When you need to go over the data you have so far, you can head to the “Year Totals” tab for a complete overview of all the amounts you’ve spent on these expenses. 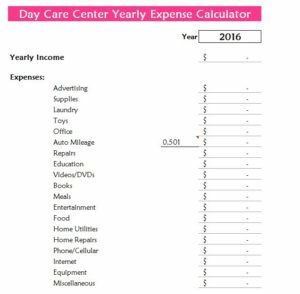 The free Day Care Center Yearly Expense Calculator gives you exactly what you need to estimate the cost of running a day care.